These Raspberry & Creme Crepes are my husband’s favorite thing to eat for breakfast. Thankfully, they take very little active time and they are as quick and easy to make as pancakes. People tend to shy away from making crepes because they believe they are difficult to make. Well, they’re really not. Mine may not be textbook in appearance but they definitely taste delicious! Because I don’t use a crepe pan, they don’t come out perfectly round. I use a skillet and roll the skillet into a circular motion to get the crepe mix to thin and spread out. The key to making crepes is to get the crepe to be thin, light, but still have some fluff to it. After making the cream cheese mixture add 1 Tbsp to 1 1/2 Tbsp to each crepe. This is probably my favorite part of the crepe because the filling is sweet without being too sweet… I’m guilty of eating just the filling! 😊 Although, it does taste amazing with the raspberries. Adding the raspberry compote makes every bite of these crepes full of fresh raspberry flavor. Just spread the compote over the cream cheese filling to give it good coverage and you’ll get fresh raspberries in every bite! The combination is unbelievably good! 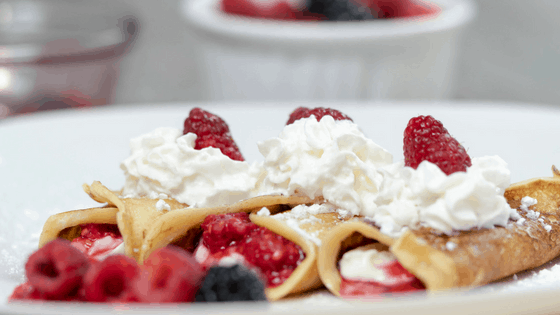 Topping these Raspberry & Creme crepes off with whipped cream and fresh raspberries makes every bite even more delicious and makes it even more appetizing. You surely won’t have to twist any arms for anyone to give it a try. If you liked this recipe – Check out my other delicious recipes here! You’ll find a variety of dinner recipes, snacks, and desserts. Make sure to like me on Facebook so that you can always be up to date on my latest recipes! Crepes with fresh raspberry and cream filling. Mix together beaten egg, milk, and salt in a small bowl. Gently stir in baking powder, confectioner's sugar, and flour. Cover and chill in refrigerator for 45 minutes to an hour. Combine softened cream cheese, milk, vanilla, and confectioner's sugar together in small bowl. Mix well and set aside. In small saucepan combine raspberries and sugar and bring to a simmer. Break down raspberries and allow sugar to thicken sauce. Stir frequently. Add fresh lemon juice, stir well, and set aside. Heat skillet to low medium heat and add 1 tsp butter to pan and allow to melt. Spread 1/4 cup mixture onto skillet and move skillet to allow crepe mixture to spread and thin out. Cook crepes for 30 - 45 seconds or until golden brown and firm on edges. Flip crepe and cook for 30 seconds more. Place crepes on plate and add 1 to 1 1/2 tbsp of cream cheese mixture onto crepe. Top with Raspberry compote and roll up. These crepes sound incredible! I would love to sit down to a full plate of these for breakfast! I am a huge crepes fan and this recipe is simply amazing!! I love crepes! This is a delicious idea for a filling! crepes are like my favorite thing ever!! This looks absurdly delicious!!! Now I am craving for crepes so much! I don’t own a crepe pan so I am inspired now to make some crepes. Love your fillings.